The year is sometime around 50 CE. Many in the early church believed that Gentiles could not be Christ followers because Jesus was Jewish. Paul believed that Christ called to all people. From Paul’s perspective, “There is no longer Jew or Greek, there is no longer slave or free, there is no longer male and female; for all of you are one in Christ Jesus” (Gal. 3:27–28). Paul thought that Peter, the other major pillar of the early church, understood and agreed with his arguments; until recently, Peter was gladly associating with Gentile converts. But suddenly Peter is succumbing to pressure from hard-line Jewish fundamentalists and having nothing to do with non-Jewish Christ followers. Even worse, Peter is convincing others, including Paul’s trusted confidant Barnabas, to do likewise. Peter is simply trying to protect the church by not inflaming the widespread anti-Gentile sentiment. But Paul is having none of this. Paul is furious with what he sees as Peter’s hypocrisy. 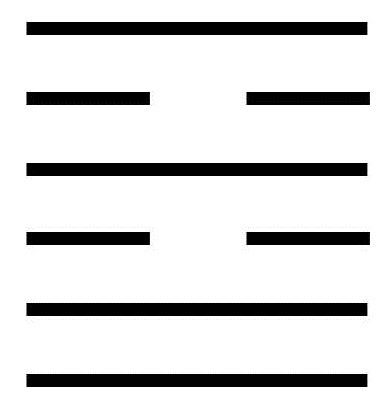 This hexagram consists of the images of Fire over Lake. Fire reaches upward, while Lake drains downward. The two forces are thus in opposition. To recognize that opposition and disagreements among the community make it difficult to work together to achieve common goals. To categorize the divergences and thereby create the seeds of future order. A moving line in the bottom position suggests that when opposition has become manifest, unity cannot be achieved by force. When others are in opposition, it is best to wait for them to decide on their own to return. Conflict may encourage those who should not be part of us to try to join us. Don’t force them away; endure them knowing they will drift off on their own. A moving line in the second position warns that misunderstandings make common ground difficult to find. It is best to wait for God to arrange meetings between those who really belong together. A moving line in the third position portrays one who feels like Job: conspired against by the whole world, lost, dishonored, and friendless. Now is the time to remain faithful to one’s companion and have confidence that a favorable outcome will unfold. A moving line in the fourth position suggests that although isolated, one may meet another who is simpatico, a companion who can be trusted. These two wills can then unite and work together for a common vision. A moving line in the fifth position counsels that one may be failing to recognize another who is simpatico. Such a person may be hidden because of stressful conditions. Over time, the other reveals an inner affinity, and then it is one’s duty to reach out. A moving line in the top position warns against misjudging one’s best friends. The problem is not external opposition; the problem is one’s own suspicious nature. One is advised to look more closely at the other. The other’s intentions are pure, and the two can achieve unity in purpose. Just when the conflict seems most severe, the resolution becomes evident.